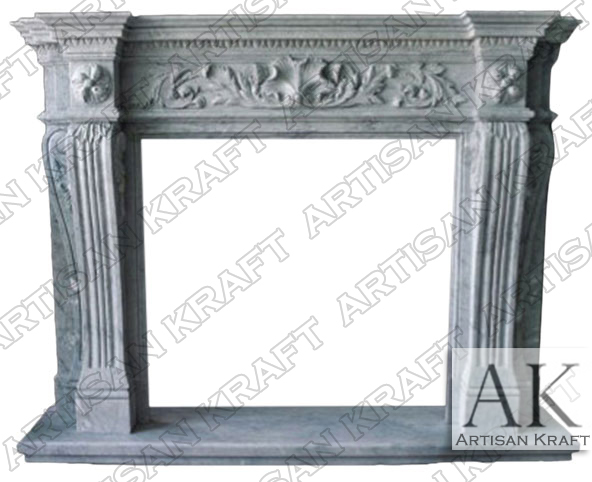 New York Marble Fireplace Mantel carved from a grayish white marble. Stately in it style and design. Four fluted corbel legs stand on the sides of the firebox. Two corbel column legs facing froward. The other two corbel marble fluted columns facing away in opposite directions. New York with its historic building and long history has always been a city where fireplace mantel surrounds are welcome. Not just due to the bitter cold winters but for the companionship that a warm fire brings along with it. Typical Dimensions: 62″ wide x 50″ high *can be made to custom dimensions. Stone: Limestone, sandstone, marble etc. Available in many different colors, textures and finishes.